A beautiful fireplace can enhance any room! A wonderful feature all year long, a fireplace serves as the main feature in most homes. There is absolutely no greater feeling than coming back to a roaring fire after shoveling feet of snow in the winter. Even when a fireplace is turned off and not in use it makes for a beautiful design element in every home. A zero-clearance fireplace is able to be safely installed into any home. 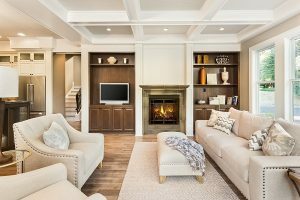 These fireplaces are highly desirable due to their great benefits and why more and more homeowners are flocking to them lately. Unlike a regular fireplace, a zero-clearance fireplace provides your home with the ease of quick and cost-effective installation. There is no laborious process as is the case with a regular masonry fireplace. With a zero-clearance fireplace, homeowners can rest easy knowing that they don’t have to spend a fortune for the labor of installation. Zero-clearance fireplaces are able to fit into the most unusual of spaces. If your home has an odd shape, you can still have the luxury afforded by a fireplace. Since they are already heavily insulated, there is no worry about installing a bulky venting system. Therefore, you can install zero-clearance fireplaces in almost any size or shape location in your home. With almost all pre-fabricated machines, zero-clearance fireplaces are very simple to use and operate. They require very little to start a roaring fire. The distinct design of a zero-clearance fireplace allows for minimal repairs as opposed to the extensive cost of repairs that come with regular masonry fireplaces. From marble to slate, you can customize what surrounds your fireplace. In terms of design, there are benefits to both. It all just depends on the homeowner’s design aesthetic. With slate, you benefit from a heat-resistant material that will be able to withstand a lot. However, marble is a great option for homeowners who desire a material that is both durable and elegant at the same time. We use the latest technology to make sure that your surface is designed, cut, and finished exactly how you envision it. We’ve been in business since 2004, and we have been updating our services to better provide customers with quality products ever since. Rock Tops Fabrication has projects and success stories littered throughout Maryland and D.C.. Are you interested in quality, customized, beautiful fabrication? Contact us today! This entry was posted on Friday, February 17th, 2017 at 2:58 pm. Both comments and pings are currently closed.